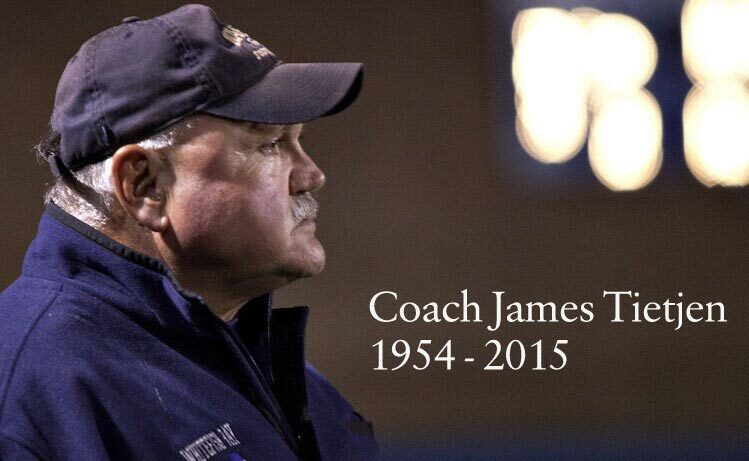 There is no possible way to tell the history of Whitefish Bay Blue Dukes Football without talking about Coach James Tietjen. In fact, for the dozens of young men that he coached over his 37-year career, there’s also no way for them to talk about their personal success without mentioning his name, as well as their gratitude to him for who they became as men. Jim Tietjen was more than a football coach, though he was certainly that. Over his 14-years at Whitefish Bay, he helped lead his beloved Dukes to several conference championships, delivered many of “his boys” to the college gridiron and watched with pride as a select few ascended to the NFL. His passionate leadership, uncompromised discipline and natural talents won him admission to the Wisconsin Football Coaches Association Hall of Fame in 2014. Tragically it was only a year later that Jim lost his battle with terminal brain cancer at the age of 61. His passing echoed across the Milwaukee metropolitan area, and hundreds of parents, coaches, former players, educators and civic leaders stood patiently in the brisk embrace of a Fall afternoon and into the night to to say goodbye to their mentor, colleague and friend and pay their respects to his family.For most of the day, the line for his wake circled an entire city block around the Ferrick Funeral Home in Shorewood, WI. Coach Jim Tietjen will never be forgotten, and this page stands as a tribute to his legacy both on and off the field.